Ride leaves from Ferndale, probably Pleasant Grove Baptist Church, at the corner of Kanis and Ferndale cutoff. Lunch on the way. Right now, we do not sag vehicle Friday morning to bring our baggage. Ride will return Sunday. 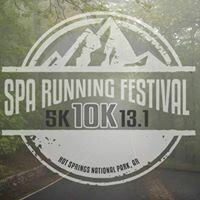 Riders may enter the Spa Run on Saturday, 10K run or 5K run or walk (we have an Arkansas Bicycle Club team if you register). Most of us are staying at Park Hotel next to Arlington, 501-624-5323. Single room is about $174 to 190 total for the 2 nexts. Also you can stay at the Arlington. I believe they have a Spa Run Rate. UPDATE: Lucy will now carry our gear but she won't come over until Friday after work. Get your luggage to her by Thursday evening or Jim or Coreen before that.